As the holiday gets in full gear many of our listeners and readers know we try to do cool stuff for them, but every once in a while a cause comes up that needs to be shared. While we did not get to work with Komen for the Cure this year a very awesome event was brought to our attention by close friend of mine. 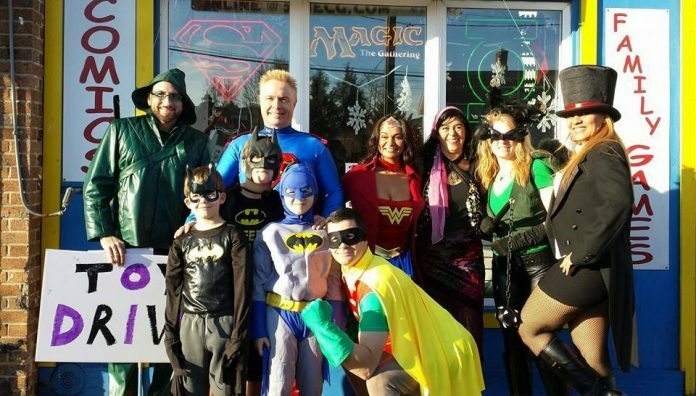 Grasshopper Comics located in Willison Park, New York is holding their annual Charity Raffle and Toy Drive. The proceeds from this event will go to the John Thiessen Children's Foundation. In addition to doing something for a great cause by donating toys, you'll get a chance to participate in their raffle which has a ton a great stuff to giveaway including Lootcrates, wrestling tickets and so much more. Here are all the details straight from the source. Toy Drive and Charity Raffle! [12:00] PM – [3:00] PM: Toy Drive! – Meet Darth Vader, Imperial Stormtroopers, Superman and more! – Artists Sketching & Signing: Meet Chris Giarusso, Jacob Chabot, David Gallaher Tom Travers, Pat Reilly, and Greg Schiegl! – Kids, come in costume and win a prize! [6:00]-[8:00] PM: Food & Cookies Go Out! – Don't miss Elaine's famous cookies! Will she cross the 1,000 cookie mark this year? Here it is, the initial prize list for this year's raffle. As you'll see there are lots of sketches and signatures on this list as well as a few very cool exclusives. There are at least a few prizes still on their way to us with at least one very cool prize we're waiting to actually have in our hands before we announce it. So stay tuned for updates. Based on some of the art that we're still waiting on, we will most likely once again having two auctions this year, with some of the original art held for the special “art auction”. OK, here's the list! If you are the Queens/ Long Island area we definitely would appreciate if you share and retweet to spread the word. To learn more about the John Theissen Children's Foundation head here.